Tokeneo Exchange got a license! 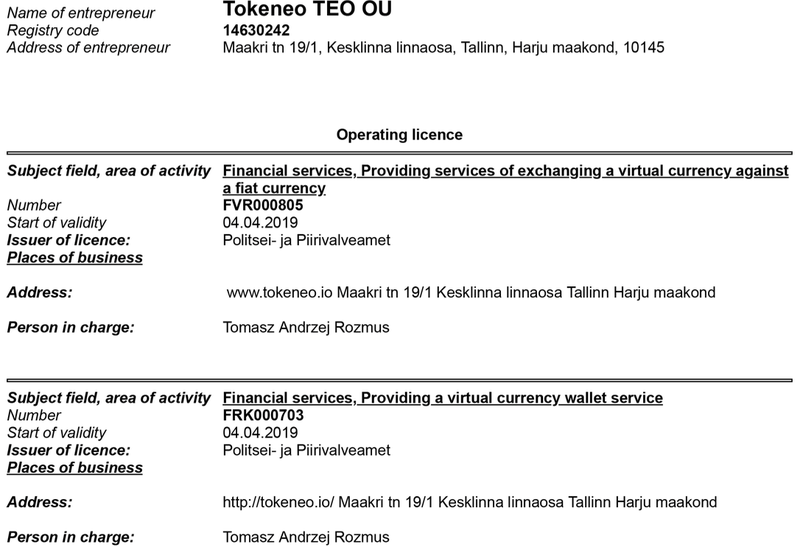 Tokeneo Exchange is one of the most innovative projects on the market, and on the 4 of April 2019 it got a business license. The last few months were very busy for Tokeneo project. ICO turned out to be an international success and the majority of products are being tested. 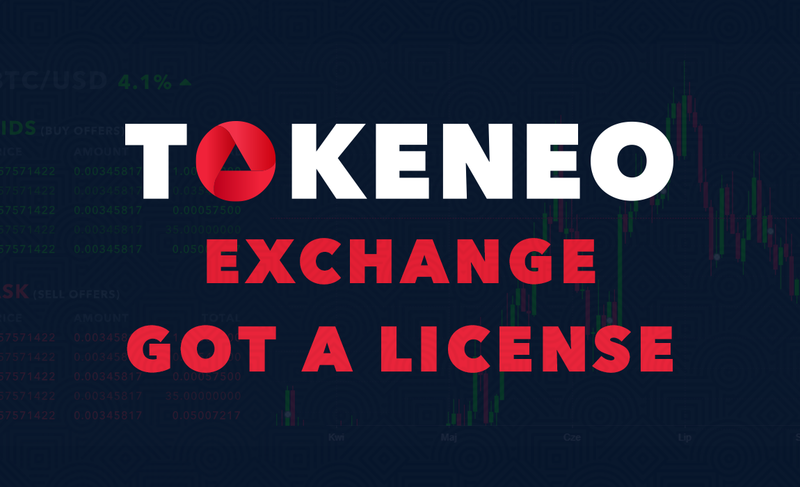 On the 4 of April 2019, Tokeneo got a license to run a cryptocurrency exchange. This license includes utility token exchange, cryptocurrency cantor, a launch of an ICO and emission of equity tokens. The permission granted by an Estonian regulator consists of two licenses. The first one incorporates a cryptocurrency exchange, exchange of fiduciary currencies into cryptocurrencies and running a cryptocurrency cantor. The second license concerns financial services, which means that Tokeneo exchange will be able to offer its own cryptocurrency wallets. This license is not limited only to the emission of normal ICO (Initial Coin Offering) tokens; it also includes emission of ETO (Equity Token Offering) tokens with dividend rights. As a result, Tokeneo exchange will be able to emit up to 2.5 billion Euros per year for any number of persons and with no minimum deposit, due to which Tokeneo exchange becomes a multifunctional product allowing not only personal trades but also large-scale cryptocurrency crowdfunding. Despite the market’s collapse, together with my team I’ve done two ICO projects — Cryptoinvestia cryptocurrency fund and ecosystem of cryptocurrency services known as TOKENEO. In spite of adverse conditions and a decrease of affection towards cryptocurrencies, we’ve spent that time to prepare cryptocurrency products before the next boom. The results of our work are both Tokeneo.News, a website providing the biggest number of news on the Polish market, and already functioning cryptocurrency cantor, Tokeneo.Cash. On the 22nd of May we will begin another project — the only cryptocurrency exchange worldwide which splits profits gained from commissions among owners of the TEO exchange tokens. The time of declines is over. I’ve carried out very detailed analyses — the first one, on the 19th of March, studied the price and volume and estimated that Bitcoin is being strongly amassed. The second one from the 1st of April identified a so-called BackUp formation on the chart, which is nothing else than a removal of the supply. In both cases the target of take-off amounts to $6425. This commotion is being backed up by large capital, so with certainty I can say that we’re starting to overcome our problems. In Estonia, the Ministry of Economic Affairs and Communications supervises financial companies and businesses working on the capital market. Every regulated subject is being noted in the MTR registry — an official database storing data about companies and investors offering financial services in Estonia. The aim of the ministry is the development of the economy through a proactive and liberal approach to both regulations and the cryptocurrency market. It is supposed to limit the number of irregularities and improve transparency of financial flow at the same time. Tokeneo exchange will provide the virtual coin market with completely new quality — it is the first project which depends on the community in the world; it will share 50% of its profits among investors, i.e. owners of TEO tokens. All of this is possible thanks to an authorial solution — Teoshare, the system of sharing of profits. The exchange’s functioning will be possible due to last year’s ICO and cryptocurrency fund Cryptoinvestia. Exchange’s launch is supposed to take place on the 22nd of May. Tokeneo aims at being the very first exchange which you can really own.